This shortcut recipe uses chocolate cake mix to churn out about 70 brownie-like mini muffins! Sure, you could use the hard Baileys in this, but nonalcoholic Baileys Coffee Creamer makes this kid and workplace friendly–and a LOT cheaper. Prep your mini muffin pans(s) by placing liners and dousing with nonstick spray. Note that the recipe makes about 70 mini muffins. Preheat the oven at 350-degrees. 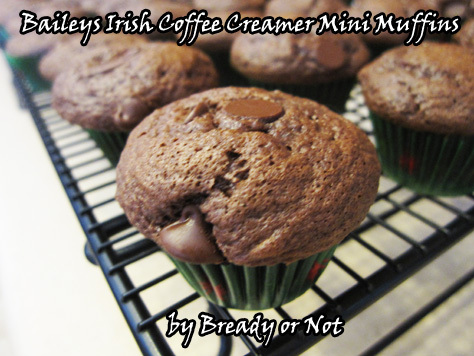 In a large bowl, mix together the cake mix, eggs, oil, and Baileys Creamer. Once that's mixed to show no clumps, add the chocolate chips. The batter will be a little runny. A teaspoon scoop makes it easy to dole out batter into the liners--but don't fill to the top! They will grow as they bake. Top with a few extra chocolate chips, if desired. Bake for 10 to 12 minutes, until the tops are springy and the innermost muffins pass the toothpick test. Use a fork to pop them out and onto a rack to cool. Store in a sealed container in the fridge or at room temperature.